New features improve your experience on Science Exchange. Researchers requesting services who have recently logged in to your Science Exchange account may have noticed the improvements we have made to your Dashboard! We hope that these changes will make it even easier to communicate with your service providers, manage projects, and compare quotes. Ultimately, our goal is to help you make better decisions, faster, with maximum transparency. In this post, we summarize what is new in the dashboard for requesters. If you have not yet requested services through Science Exchange, the new dashboard makes doing so as easy as possible. Use the Marketplace for fastest access to providers. Type keywords into the Marketplace search bar, such as “ELISAs,” “Boston BioSource,” or “Cambridge MA,” to search our network of service providers. Requests are sent directly to the providers, giving you the fastest access to our network. Enjoy white-glove sourcing with our Concierge service. 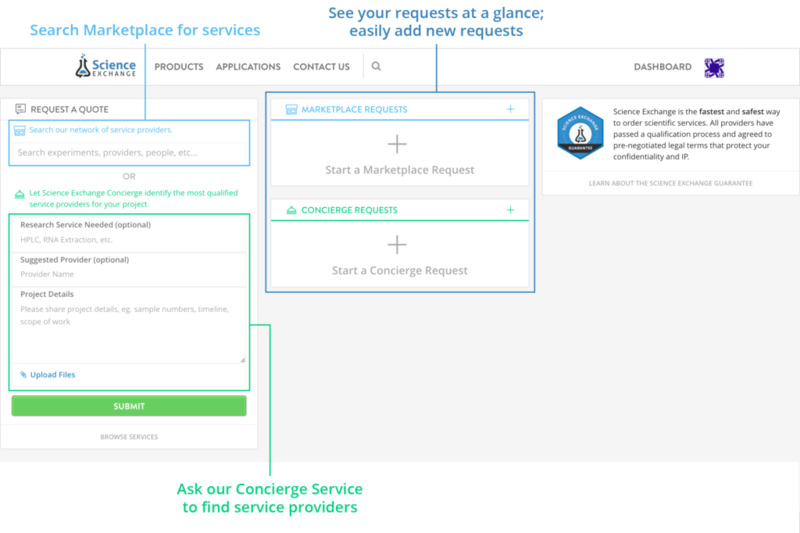 Ask our Concierge service to find service providers by submitting the short webform. This will engage our Masters- and Ph.D.-trained Sourcing Managers, who will gather quotes from the best service providers for your project. As you can see below, the Dashboard makes it easy to identify and communicate with the people with whom you are working, for each project. If you have experience outsourcing research projects, you know well that better communication is key for obtaining reliable study results. Brand new to the Dashboard is the addition of the Concierge Requests panel, which allows you to track your submitted projects. Once a Sourcing Manager has been assigned, their contact information will be displayed. 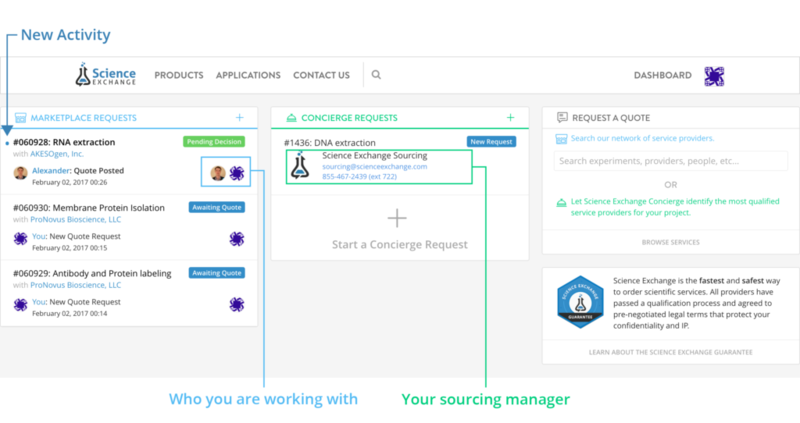 Please reach out to your Sourcing Manager directly for updates on your Concierge requests. Once you have submitted numerous requests, you will find it useful to navigate from the Dashboard to the new Marketplace Requests page by clicking on “Marketplace Requests” to view them all. Here, you now have fine control over the way you view and manage your ongoing requests. Archive: Clean up your view by hovering over an individual request and clicking the archive icon. Archived requests will be excluded from the default view, but can still be found. Search: Quickly find your existing requests using any keywords. 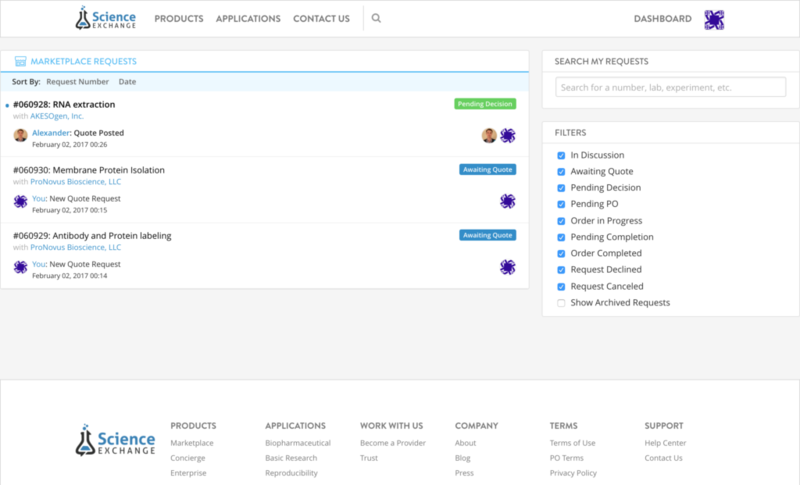 Filter: Narrow your view to requests of a specific status, or reveal archived orders. Sort: Arrange your orders either by Request Number (which orders them by creation) or by date of last activity. Any questions? We would love your feedback on this long-anticipated improvement to our site.